After another Sunday in the Plaza Mayor in Madrid, looking at ancient coins and artifacts, I picked up a car and drove to Northern Spain, Aguilar del Campoo to be exact. That's where the headquarters of the Santa Maria Foundation of Historical Heritage is located. Earlier in the year, I had found an interesting video clip from Spanish TV of a tour of Romanesque churches with sexual art. The tour was led by Cesar del Valle of the Santa Maria Foundation. Before leaving for Spain I tracked Cesar down via the internet and communicated with him. We arranged to do an interview when I next came to Spain. So when I checked into the hotel in the Santa Maria la Real Monastery, I was eager to meet Cesar the next morning. There is a short bio of Cesar, an art historian, with his interview on the articles and interviews page under the Explore Spain / Sexual Romanesque Art menu at the top. After introducing ourselves to each other, Cesar and I went to the offices of the Foundation, and Cesar gave me a tour. The Foundation’s purpose includes the study and restoration of Romanesque churches throughout Spain. They are publishing an unbelievably thorough encyclopedia of these churches. Forty-eight large volumes of an anticipated 60 have been published. The work is impressive and probably the most extensive Romanesque study in the world within a single country. The Foundation's library also contained several shelves full of the papers from courses and conferences sponsored by the Foundation. We met a fellow upstairs who shared his theory that the sexual art on Medieval Romanesque churches is actually ancient Roman sculptures that have been re-used and incorporated into the Medieval churches. However, Cesar and I share the opinion that there is no evidence to support this theory. After my interview with Jaime Nuño (see below), and an excellent lunch at the Monastery Hotel's restaurant, we went to view eight churches (Cervatos, San Cipriano de Bolmir, Santa Maria de Retortillo, we returned to Cervatos to get the key and visit inside, San Andres de Valdelomar, San Juan de Villanueva de la Nia, Santiago de Cezura, Eremitorio de San Martin de Villaren (a church carved out of rock), y San Martin de Matalbaniega). The visits were accompanied by a healthy dose of conversation on the sexual art and its meaning. 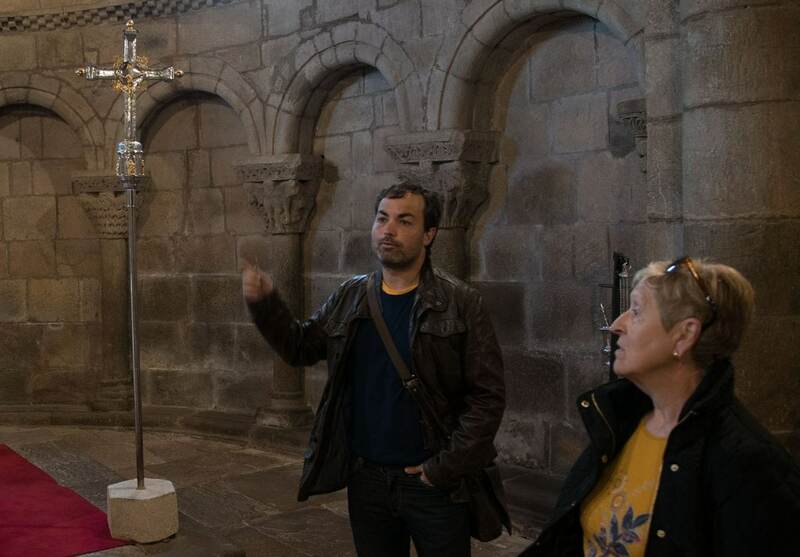 Upon return, Cesar gave me a tour of the monastery, explaining the history and the art there. We ended up in the bookstore, always a dangerous place for me. When we wrapped up, it had been over a 12 hour day! Many thanks to Cesar for being such a good host. There is a short video of a conversation between Cesar and me on the website. I also met Jaime Nuño, the Director of the Romanesque Center of Studies of the Foundation. 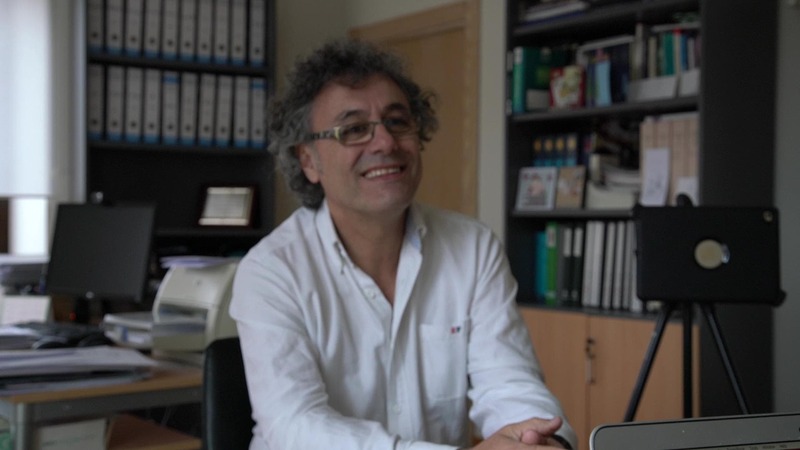 He had published an internet article (the article in both Spanish and English is available under Exploring Spain above) on the sexual Romanesque art, and I was privileged to have the opportunity to interview Jaime on this subject. There is a short bio of Jaime, an archeologist, under my About section above. The interview lasted almost two hours, and highlights are available in several videos here. The videos are in Spanish, and the complete transcripts in both Spanish and English are available as well. They are all under the Explore Spain / Sexual Romanesque Art menu at the top, as is Jaime’s article. Thank you, Jaime, for taking the time to discuss this fascinating subject with me. 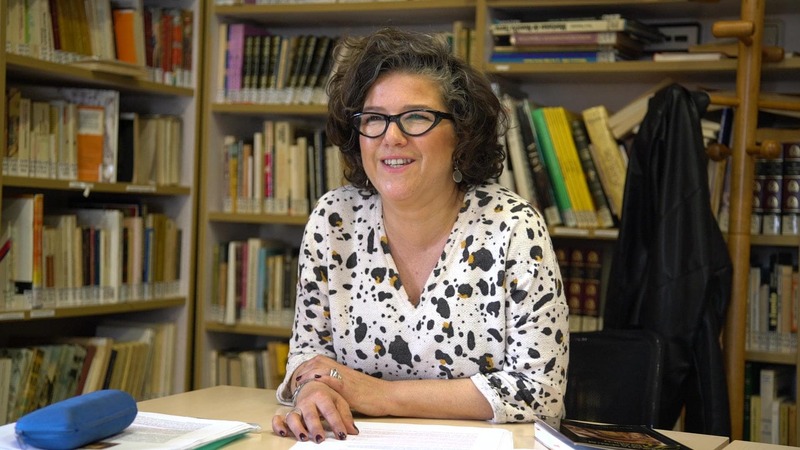 After participating in the fiesta of San Isidro in Madrid (chapter 5), I drove back to Cantabria, to Reinosa, for an interview with another historian. I had found an interesting article on the sexual Romanesque art, and located the author – Maria Paz Delgado Buenaga. Paz also agreed to an interview on the subject. A short bio of Paz’s studies and experience can be found under my About section in the top menu bar above. I traveled up to Reinosa in the afternoon, stopping at the San Lorenzo church for some photos. After checking in at the hotel, I walked around the city sampling tapas and wine. The next morning I met Paz for a light breakfast as we got to know a little more about each other. Then we went to the library of the Barcenillas Foundation. Here she was responsible for the management of the library for many years, and we recorded the interview here. Paz's article, to be found under Explore Spain in my menu above, was written back in June 1996. I soon discovered that Paz had done considerable recent research after agreeing to the interview, to bring herself up to date on the subject. The complete transcript of the interview, in both Spanish and English, is available under Explore Spain/Sexual Romanesque Art in my menu at the top. The video, in two parts, is also available. After the interview we had a tasty lunch to regain our strength, so we could tackle a tour of Romanesque churches of the Cantabria, and off we went. We visited Villanueva de la Nia, two rupestrian churches without any sculptures, Cadalso and Arroyuelos, colegiata de San Martin de Elines (only outside, we could not get the key), San Cipriano Bolmir, the Barcena de Pie de Concha, and Santa Maria de Yermo, where we met Fernando, who lives there in Yermo and who is an aficionado of the sexual Romanesque art. All the churches were impressive, and copious photos were taken. But the animated conversation with Fernando was stimulating. He knew of Paz and her work and had tried a couple of times to contact her through email. So he was delighted to have the opportunity to meet her and share thoughts on the Romanesque art. We had a long, fruitful conversation, but I had to cut it short. It was late, and I still had to drive back to Madrid. I have maintained contact with both Paz and Fernando and hope to visit with them both on my trip to Spain next year. Thanks Paz for all the time you dedicated to this endeavor, not only the interview and church visits, but your research as well.